The term conservation emerged in the late nineteenth century to refer to the management—basically for economic reasons—of such valued natural resources as minerals, pastureland, timber, and topsoil. Conservation became part of U.S. government policy with the creation in 1871 of a U.S. commissioner of fish and fisheries. The conservation school of thought, with its focus on the wise use of resources, often conflicted with the preservation school of thought that sought to preserve resources for their intrinsic values. Today, conservation of natural resources encircles the general idea of conserving the Earth itself by protecting its capacity for self-renewal. The most fundamental and essential of all these natural resources is water. Without water, life on Earth would not exist. Water conservation is defined as those activities designed to reduce the demand for water, improve the efficiency of its use, and reduce losses and waste. The purpose of conservation is to protect water resources and to achieve, at lower costs, the benefits from its use. This is achieved through measures such as water-saving devices, water-efficient processes, water demand management, and water rationing. A key to water conservation is getting people to recognize the value of water and not using it as if it were a free good. Almost every country in the world faces a growing challenge to meet the increasing demand for water that is driven by expanding populations and economic growth. Water supplies are affected by more industrialization, mechanization, urbanization, and their polluting byproducts. Water conservation is playing a greater role in water resources planning due to the difficulties of developing new water sources, trends of increasing frequencies of droughts, increased environmental concerns, and legislative mandates such as the Safe Drinking Water Act. Most U.S. states are continuing to develop and implement comprehensive water resource management plans. These plans serve as guidelines for overall water resource management and set targets for smaller, local utilities to provide adequate water supplies. Comprehensive plans are increasingly popular as a method of combining supply and conservation projects. One of Santa Clara's (California) water conservation measures is participation in the South Bay Water Recycling program, which captures treated wastewater from eight communities in Santa Clara that would otherwise be discharged into San Francisco Bay. The reclaimed wastewater is used to irrigate golf courses, parks, schools, and agricultural land, as well as for industrial processes. water, or improve land management practices to conserve water." Historically, local conservation has been a valuable part of water resource plans because small savings can add up to large volumes of water saved. Conservation benefits to the customer include reduced water bills and greater water supplies that help in better economic development. Environmental benefits include ecosystem and habitat protection. Decreased water demand also has positive implications for tourism, especially for the recreational use of waterways. Water conservation can be achieved through stronger plumbing codes, promotion of conservation devices, pricing levels, and public education. These practices have all shown positive results in the United States. Improvements in the efficiency of older supply infrastructure . Conservation measures are services that are desired by customers while, at the same time, use less water than traditional practices. An example of a conservation measure is the requirement for low-flush toilets to work as well as older, high-flow toilets. Measures that achieve long-term, permanent reductions in water use by changing behavioral activities are called demand management. A water conservation plan that emphasizes demand management frequently includes the following practices and technologies. Communities may enact a minimum rule that limits lawn and garden irrigation to restricted hours, generally during early morning or late evening when less sunlight and winds minimize water evaporation. Xeriscape, or "dry gardening," is defined as a method of improving the character of land that maximizes water conservation by the use of site-appropriate plants and an efficient watering system. Using organic mulch that minimizes evapotranspiration , reduces weed growth, slows erosion, and helps reduce soil temperature fluctuations. The installation of ultra-low-volume (ULV) plumbing fixtures in new construction is often required to save water while still providing desired services. Permit regulations usually specify that fixtures possess a maximum flow volume when pressure is (for instance) 80 pounds per square inch. In this case, the maximum flow volume is normally 1.6 gallons per flush for toilets; 2.0 gallons per minute for faucets; and 2.5 gallons per minute for showerheads. The goal is to attain ongoing savings without behavioral changes. This measure requires that any person purchasing or installing an automatic sprinkler system must install and operate a rain sensor device or an automatic switch. This equipment will override the irrigation cycle of the sprinkler system when adequate rainfall has occurred. Seasonal pricing, in which water consumed in the peak demand season is charged a higher rate than in the off-peak season. 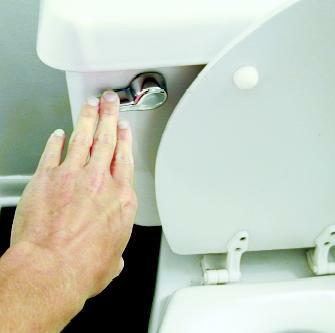 Toilet flushing is the largest indoor household use of water. Replacing an older toilet with a water-saving one is a good investment. Leak Detection and Repair Program. Public water supply systems desire to attain a 10 percent or less unaccounted-for water loss. When actual loss is greater, then the implementation of leak detection programs is required. The program must include auditing procedures, and in-field leak detection and repair efforts. Public information will inform citizens of opportunities to reduce water use, give reasons why they should choose to practice conservation, and publicize the conservation options being promoted. Nearly all users can be affected by public information efforts, although they are typically targeted at the uses with the broadest participation. All individual commercial and industrial users submit a conservation plan that generally includes: audits of water use; implementation of cost-effective conservation measures; employee conservation awareness programs; and feasibility studies of using reclaimed water. Water conservation is not an isolated activity and its social acceptability is related to many factors such as the characteristics of the utility market; the pricing system; and economic, political, technological, and willingness to conserve. By the time that water conservation is necessary, the public has already developed established use patterns and may be resistant to changing these patterns. To change social consciousness about water resources, an understanding of all the issues is critical. Public perception often is influenced by an effective campaign to highlight the positives of these new decisions. Drought situations often highlight the need for conservation measures and increase social acceptability. Water conservation has financial advantages for both customers and utilities. The consumer benefits from the efforts at reducing water use through lower bills. For utilities, conservation reduces the magnitude of, and delays the need for, costly infrastructure development projects. For society and the natural environment as a whole, water conservation efforts can minimize the alteration of the natural landscape, thereby benefiting recreational activities, the aesthetic quality of surroundings, as well as the preservation of wetlands and wildlife habitats. SEE ALSO Demand Management ; Population and Water Resources ; Pricing, Water ; Rainwater Harvesting ; Reclamation and Reuse ; Supply Development ; Uses of Water . Broydo, Leora. "The Great Xeriscape: Low-water Landscaping, Includes other Household Environmental Tips." Mother Jones vol. 22 (May 15, 1997):21. Gibbons, Whit. "Whither Our Air and Water?" The World & I vol. 14, issue 6 (June 01, 1999):184. Gleick, Peter H. "Safeguarding Our Water: Making Every Drop Count." Scientific American vol. 284, no. 2 (February 01, 2001):38. Vickers, Amy. Water Use and Conservation: Homes, Landscapes, Industries, Businesses, Farms. Amherst, MA: WaterPlow Press, 2001. Guidelines for Water Conservation Plans. U.S. Environmental Protection Agency, Office of Water, Office of Wastewater Management. <http://www.epa.gov/owm/factsheet.pdf> . "Using Effective Water Conservation Measures can Save Millions of Taxpayer Dollars" Within Water Conservation Program. Federal Energy Management Program. <http://www.eren.doe.gov/femp/techassist/waterconserve.html> . Water Conservation. Municipal Research and Services Center of Washington. <http://www.mrsc.org/subject/environment/water/wc-conservation.aspx> . Water Efficiency Measures for Residents. State of Connecticut Drought Response, information provided by U.S. Environmental Protection Agency. <http://www.drought.state.ct.us/efficiency.htm> . WaterWiser: The Water Efficiency Clearinghouse. American Water Works Association. <http://www.waterwiser.org/> . Avoid purchasing toys that require a constant water stream.